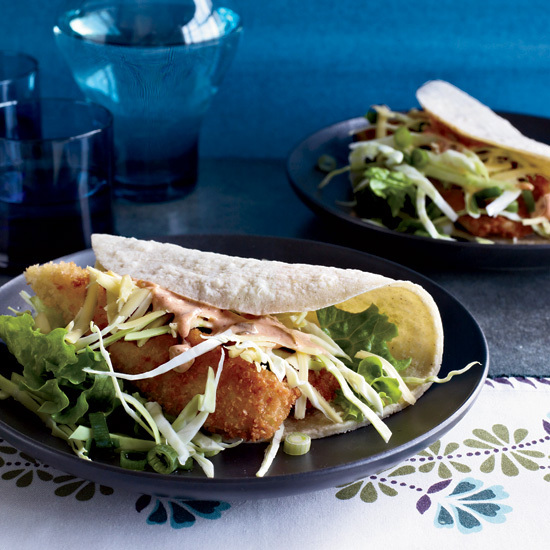 Fish plus tortillas and a topping or two of choice are all you really need for fish tacos. Here are seven ways chefs make these tacos even more delicious. 1. Extra healthy. LA chef Kerry Simon grills snapper for his tacos and serves them with crunchy cabbage and a good-fat-rich guacamole. 2. Asian-style. Atlanta chef Tomas Lee fries his fish in a crisp panko crust, then serves it with hoisin mayonnaise. 3. With spicy tomatillo salsa. Pacific halibut is the fish of choice for chef Deborah Schneider’s taco; she tops it with a jade-colored raw tomatillo salsa. 4. Quickly marinated. Phoebe Lapine adds flavor to the fish before she even cooks it by marinating it in a mix of lime juice, garlic, shallots, honey and hot sauce. 5. Dry-rubbed salmon. For a heftier fish taco, chef Jeff Smith rubs salmon with cumin, chile powder, coffee and sugar before grilling it and topping with a refreshing slaw. 6. With shrimp. Do shrimp tacos count as fish tacos? Kind of. Dallas chef Tim Byres grills shrimp on skewers, then tops them with a crunchy celery salad. 7. As a Reuben. Fish tacos + sauerkraut = pure genius by chef Amanda Hallowell of Maine’s Nebo Lodge.